Space and the high windows of the former church were two of the reasons that Malin and Anders fell for this building in Sweden. An extensive renovation, which took six intense months, transformed the mission church into a family home. 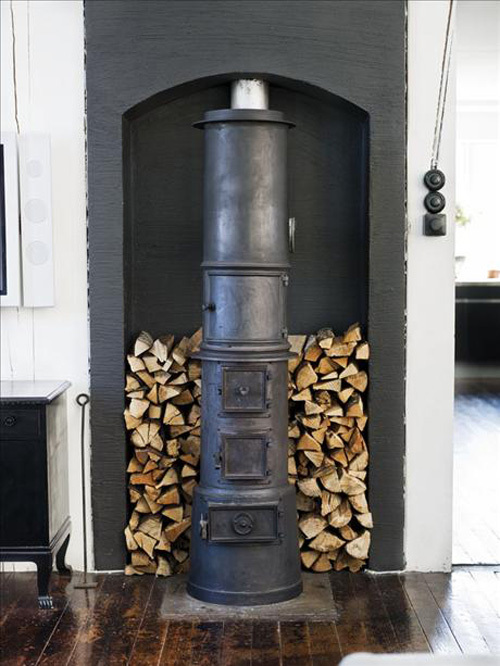 The gorgeous wood stove is one of the eye-cathers in the home. What a beautiful light they must have with those huge windows. Hopefully there will be a bit more light in your life as well. Love the woodburner. Great scale and the contrast of the two greys with the natural stacked wood behind – great visual! Are there more pictures?! I love it! Churches, the original great design. What I wouldn’t do to live in this space! I love the windows and the table! Remodeling a public structure into a home is always fascinating to me. Thanks for sharing. Love the height of the wood stove. The wood in the back looks ready for a stray ember to set it alight though.